Destination wedding photography always brings with it a chance to encounter and capture beautiful scenes. This New York bride chose to have her wedding in Cartagena, Colombia, and I was delighted to be chosen to document her beautiful celebration. The Hotel Santa Clara, which was originally a 17th century convent, sits right in the heart of the walled old city. It was also my bride's choice for her getting-ready preparations and part of her stay. This old stone stairway leads up to the second floor of the hotel, but as it is in the back of the hotel, it is not the primary stairway that guests use. Just above the mid-stairway landing, there is a high window through which sunlight streams in the late afternoon. 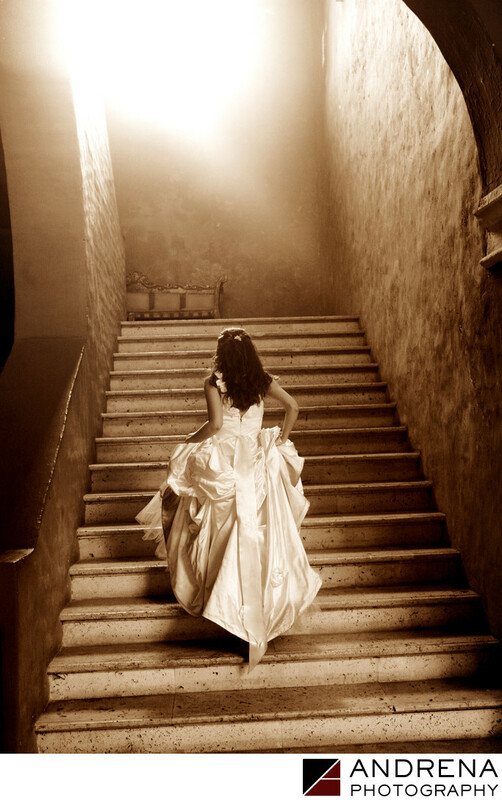 As the bride walked up the stairway in her Monique Lhuillier wedding dress, I realized that it looked as though she was climbing towards heaven. A warm-tone sepia process added to the old-world look, and seemed to better fit this image than straight B&W. I have kept this image in my portfolio for many years, and still love it. Destination wedding photographed in Cartagena, Colombia, at the Hotel Santa Clara and Santa Domingo Church.